2 Bedroom Flat For Sale in Stanmore for Asking Price £450,000. 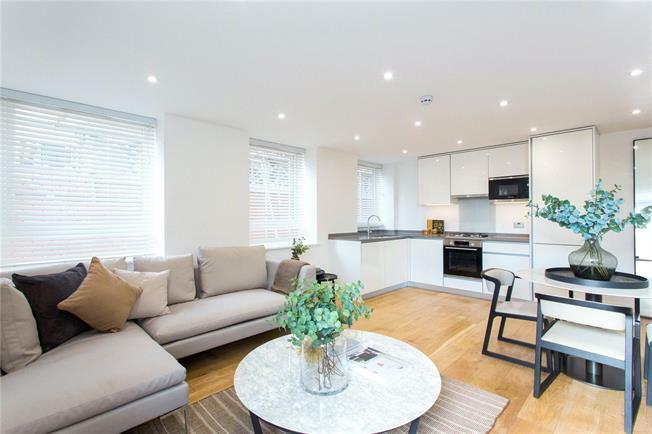 Featuring a high specification, this 2-Bed/2-Bath Second Floor forms part of a selection of apartments located within Stanmore Broadway. The flat offers a fitted Kitchen, Ensuite Bathroom, bespoke built-in wardrobes, flooring and under floor heating. Buckingham House is located in the centre of Stanmore and conveniently located for all amenities that the area has to offer. A new and existing development of 1, 2 & 3-Bedroom apartments, the scheme is ideal for young professionals commuting to central London with Stanmore's Jubilee line station within a few minutes walk. - Kitchen with Quartz worktops & upstand with stainless steel 1.5 bowl/drainer and mixer tap, high gloss door finishes, integrated Bosch appliances to include Fridge/Freezer, Dishwasher, Multi-function electric oven, Gas hob, microwave Kitchen extractor with integrated lighting, Free standing Washer dryer. - Contemporary Bathroom and Ensuite with white sanitary ware, Porcelain wall and floor tiles, Stainless steel/chrome finished heated towel rails, White vitrified enamel wall mounted WC with soft close seat and dual push button flush, mechanical extract ventilation, thermostatic mixer shower, designer taps and accessories. - Under floor heating system. - Thermally and acoustically efficient double glazed windows. - Bespoke built-in wardrobe to Bedrooms. - All flats covered with professional warranty.